The internet offers an abundance of applications to meet our needs. Yet, not all programs are created equal. Some apps require excessive system resources, that might slow down an older or weaker PC to a crawl. In this guide, we have measured the RAM and CPU usage of some of the most popular applications, as well as alternative lightweight programs for Windows, which could improve our PC experience. 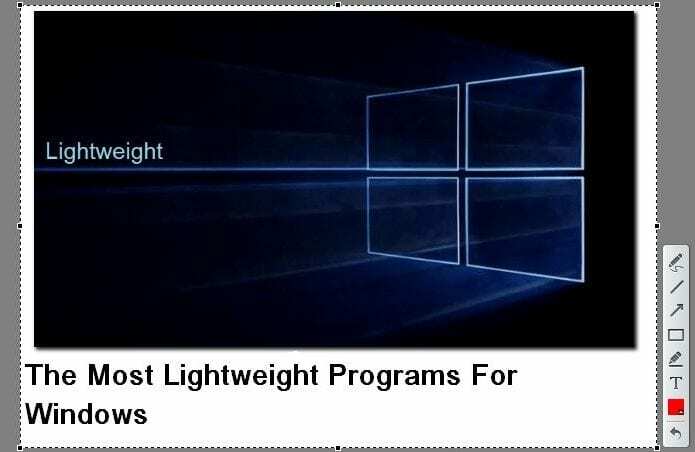 Do you use lightweight programs for Windows? When we choose a particular program, we usually make our selection based on the available features, as well as the look and functionality of the interface. However, sometimes we might forget to consider one of the most important factors: the usage of system resources. Whether we are trying to save battery on our laptop or have an older desktop that runs a little slowly, it is always of vital importance that we select the least demanding applications. Using lightweight programs to perform most of our tasks means that everything will be faster and also that we can save resources for the rest of the programs that run on the PC. So, let's start with the three main categories of Windows programs: browsers, Office suites, and media players. Among other things, we will see how much RAM they take up and how much processing power they use. 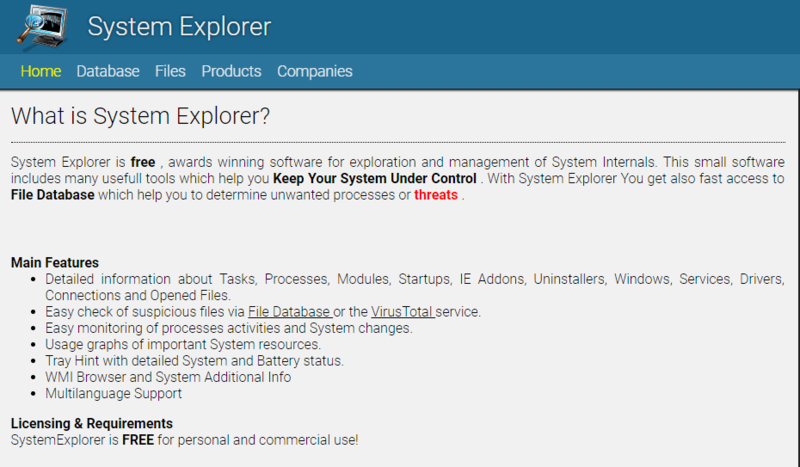 Te used System Explorer for the measurements, a specialized and particularly reliable program, according to technology websites. 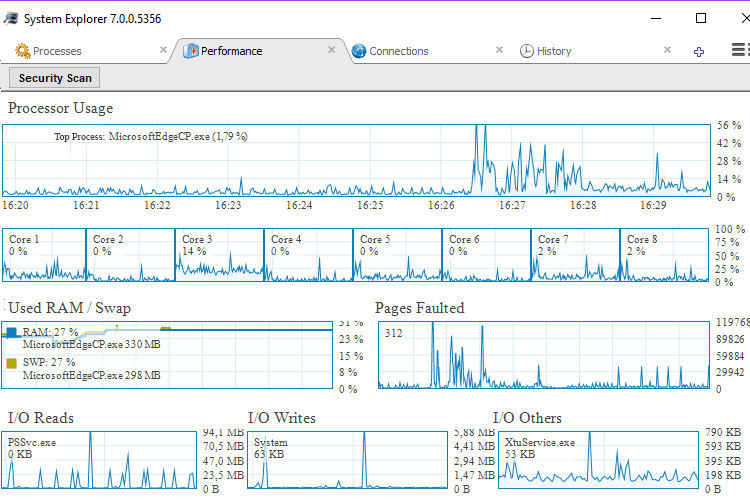 We opted for this one instead of the more popular Process Explorer because there was an option for individual graphs for each program separately. Each test took half an hour until we could get as many snapshots from each program since CPU and RAM usage change constantly. One would expect browsers to be lightweight programs. 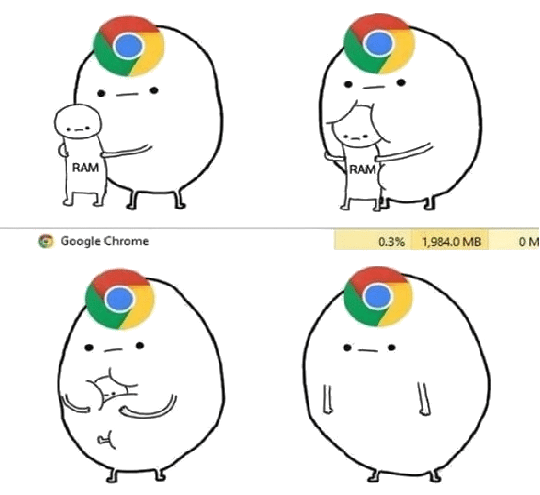 But in fact, they consume a lot of resources, especially RAM. For an 8GB or 16GB system that is not a problem, but if we only have 4GB RAM or less, even a couple of extra open tabs can overwhelm the system. For the test, we downloaded the latest editions of the most popular browsers at the moment: Chrome 66.0.3359.181 64-bit, Mozilla Firefox 60.0.1 64-bit, and Microsoft Edge 42.17134.1.0. 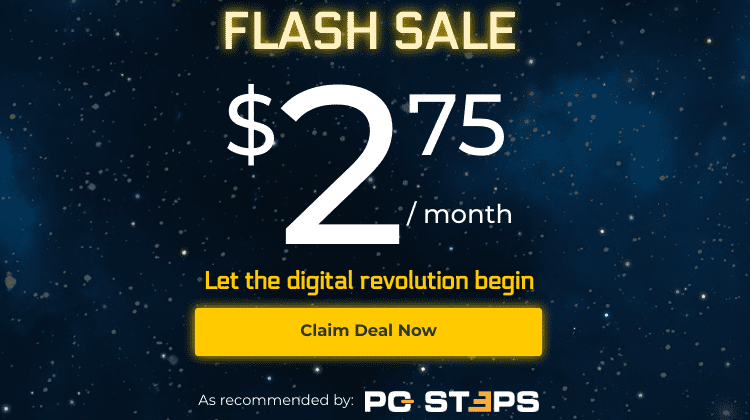 We opened five tabs: PCsteps, LifeSteps, Google, YouTube, and Gearbest, on an incognito window without extensions. Next, we repeated the measurements with five popular extensions activated (LastPass, Enhancer for YouTube, uBlock Origin, Turn Off the Lights, Office Online), running on the three browsers, on incognito mode once again. 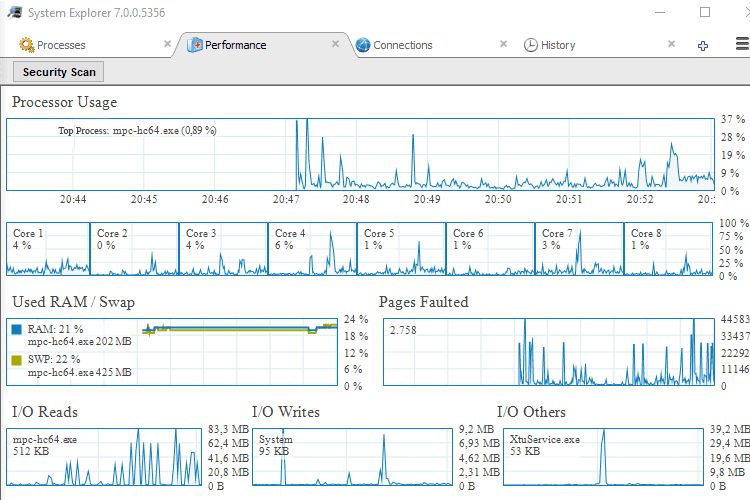 With PCsteps as the selected tab, Chrome tasks without extensions used between 0.0 and 0.1% of the CPU and approximately 24-25% RAM, which was between 225 - 240MB. 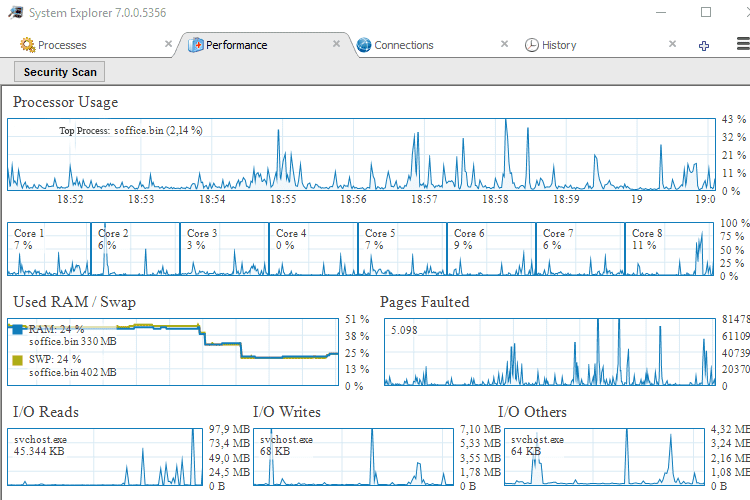 Snapshots were showing 4% use of the CPU, but the memory usage remained in the same range. 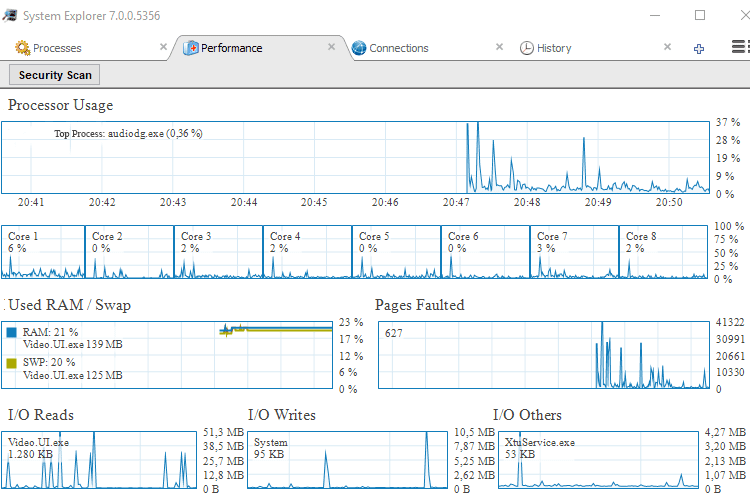 With the five extensions on an incognito browsing window and keeping PCsteps as the selected tab, Google tasks used the CPU more, and approximately 33% RAM, from 370 - 390MB. 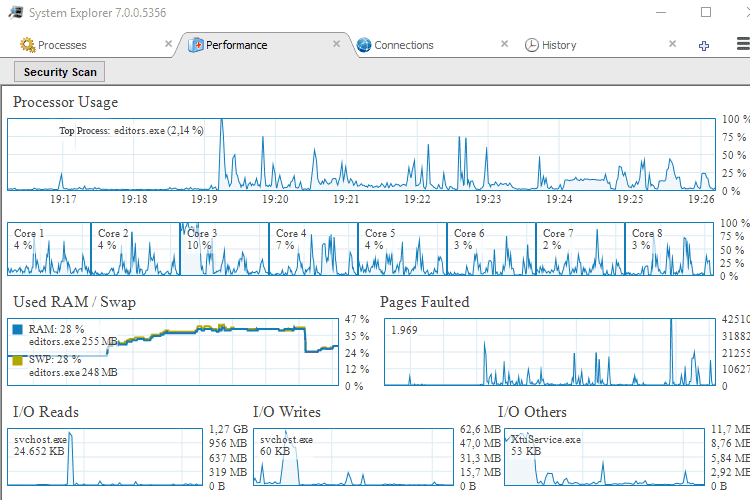 There were snapshots with 7% CPU use, but the memory usage remained almost at the same level. 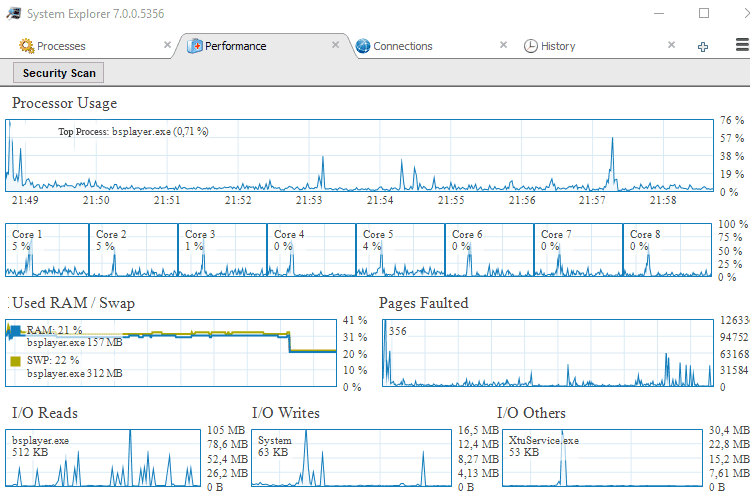 Firefox tasks without extensions used 0.0 to 0.1% of the CPU, and approximately 24-25% of RAM, which is 230-240MB. 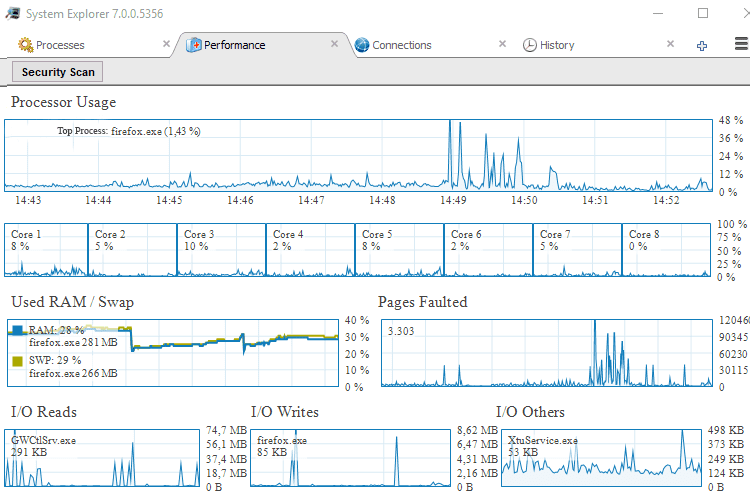 Snapshots were showing 3% usage of the CPU, but the memory use remained at the same levels. 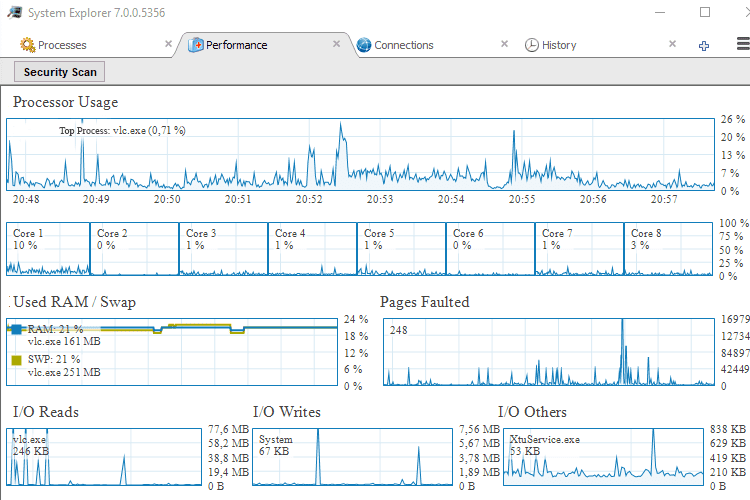 With the five extensions on an incognito window and with PCsteps as the main tab, Firefox tasks used around 0.1% of the CPU and approximately 28% RAM, that is, 280-290MB. 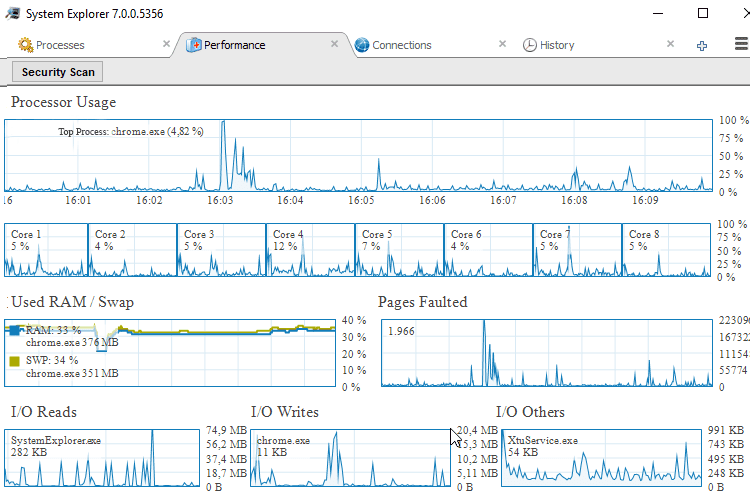 Snapshots were depicting a 4% usage of the CPU, and there were a few fluctuations in memory usage. Microsoft's browser opens instantly once we click on its icon, but it seems to use the most resources. 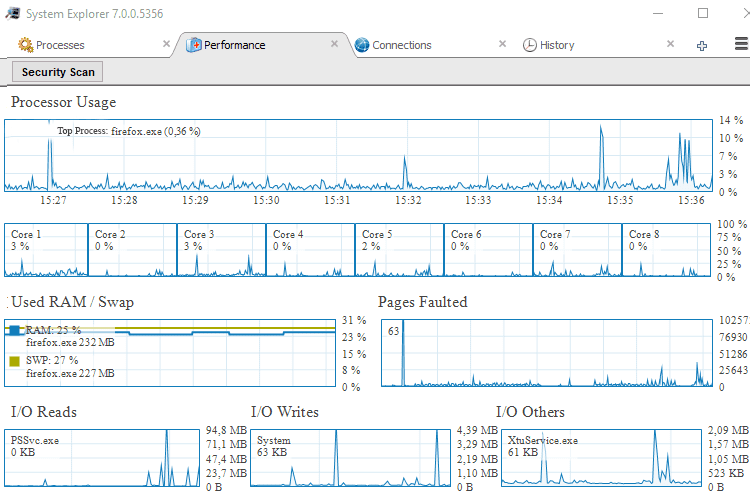 Edge tasks without extensions used around 0.1% of the CPU on average, and approximately 27-28% of RAM, 325-335MB. Snapshots were displaying a 7% usage of the CPU, but the memory usage remained at the same level. 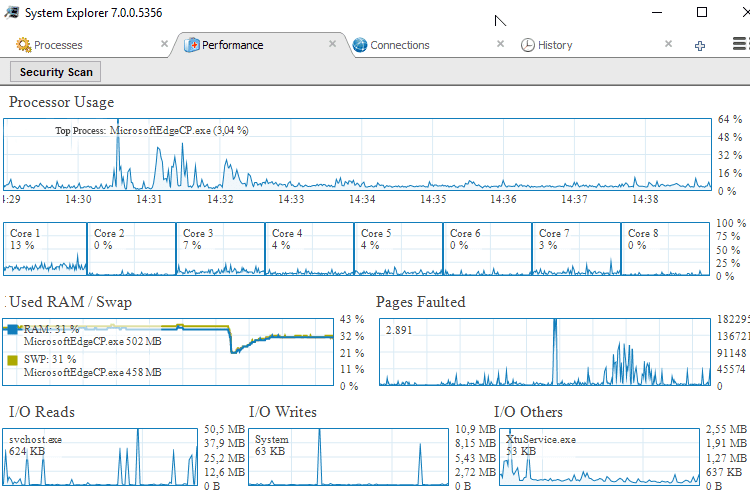 With the five extensions on an incognito window, Edge tasks used around 0.2% of the CPU and almost 495-505 MB of memory. 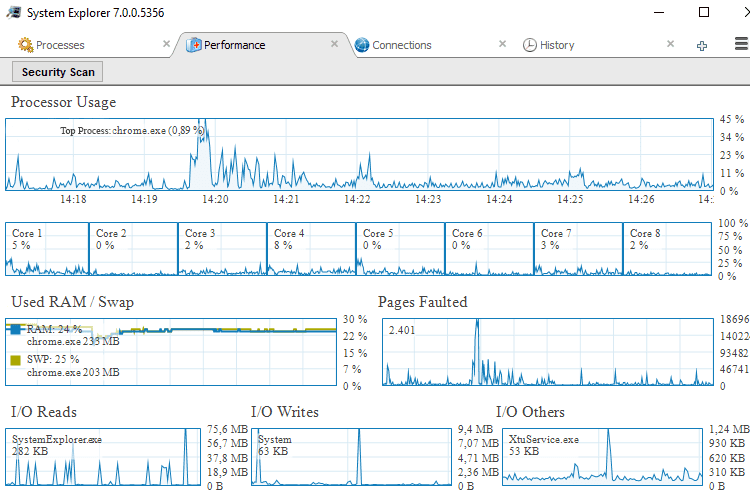 There were snapshots with 8% CPU usage, and memory usage had some fluctuations. Firefox uses the fewest resources, and it undoubtedly belongs to the most lightweight programs for browsing. Of course, there are alternative browsers which are based on the same code, and which may be even lighter. Chrome is just as light only when we use the visitor's profile without extensions. We tested Open Office and Libre Office, two very appealing programs because they offer a high degree of compatibility with Microsoft Office. For the measurement, we opened a Word file with long text and pictures, and an Excel file with multiple spreadsheets simultaneously. All the programs were running in the foreground, and we didn't minimize them during the procedure. With the document and spreadsheet edit, Open Office tasks made almost zero use of the CPU, and approximately 21-22% of RAM, more specifically 195-205MB. Accordingly, Libre Office tasks used the CPU a little more, and took up more RAM, with many fluctuations between 320-360MB. With the document and spreadsheets edit, Only Office tasks used the CPU a little more and used a 26-28% of RAM, with fluctuations between 220-260MB. Open Office uses the fewest resources on Windows. Therefore, it is, without a doubt, the most lightweight program for document editing. There is no doubt that the rise of streaming has rendered media players less significant than what they used to be in the past years. But many of us use a media player to watch films, listen to music, or watch local videos. We tested four popular players- VLC Media Player, Media Player Classic (MPC-HC), BS.Player, and the built-in Windows new player. Our test video was at 1080p. While playing the 1080p video on Windows player, its tasks made very low use of the CPU, and 21% use of RAM, between 135-140MB. Accordingly, on VLC the resource usage was slightly higher, especially as far as memory usage is concerned, which ranged from 155-165MB. While playing the 1080p video on MPC-HC, the tasks made slightly higher CPU use, and much higher RAM use, between 200-210MB. The popular player made a relatively low resource usage, at the same levels as VLC, and used between 150-170MB RAM. Windows 'Movies and TV' turned out to be one of the most lightweight programs for multimedia. The application certainly uses the fewest resources on the Microsoft operating system and also offers 360-degree rotation for some movies, which is a unique feature. However, even though it supports manually subtitles locally, with encoders, it is inferior to the three competitors, which also have many functions and support online subtitle downloading as well. In other words, lightweight programs are good, but if our computer is not very old and performs well, it is worth checking out all the options an application might offer. 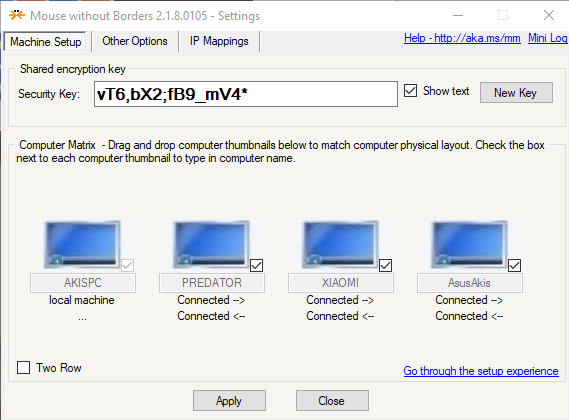 We can find a variety of different useful lightweight programs for work and entertainment, most of which we have tested ourselves and regularly use on our PCs. Therefore, they are not an object of research, and we consider them safe because many of them come from ''Windows Store.'' The order of presentation is random. Before we begin to experiment and install new lightweight programs, it would be good to create a system restore point. Hopefully and most likely we may not need it at all. But, if at any point we make a mistake or something goes wrong, we can restore our computer to its previous condition. 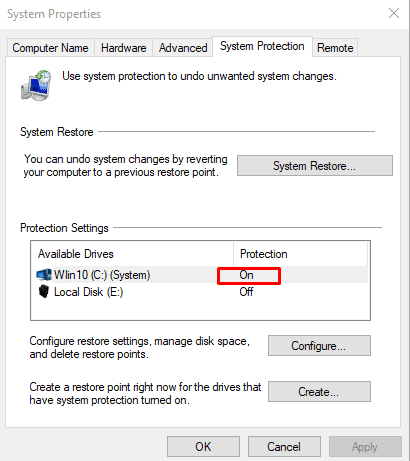 To create a system restore, we press the Windows button and ''R simultaneously..."
After we make sure that we have enabled the system restore, we select "Create..."
...we give a name to the restore point, and the process will be complete in a heartbeat. If we want even higher security, we can create Windows backup with a specialized application, such as Aomei Backupper, EaseUS Todo Backup, or Macrium Reflect. Some of you might have noticed that when we search for something using the system explorer, the process sometimes takes too long, and sometimes it is does not even complete. We can get rid of this issue for good with a very light and fast search tool on Windows, which uses few system resources. At the same time, it tracks every change on the files system. ''Everything" is a local search engine which tracks files and folders directly. 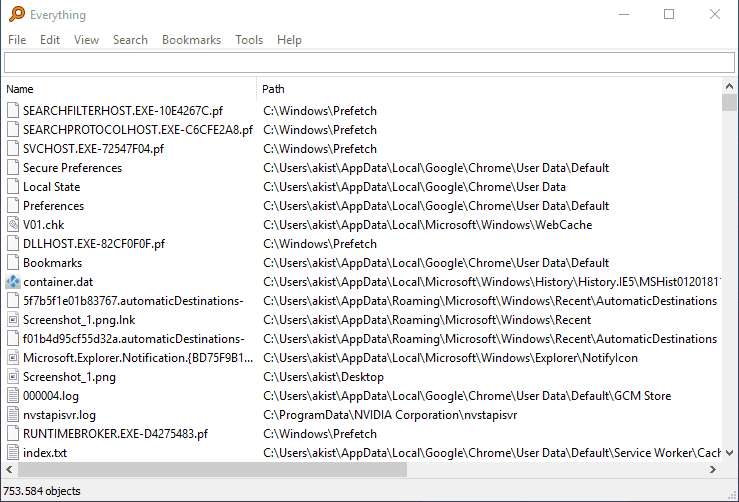 In comparison with Windows search, the free lightweight program finds even the most isolated file and folder on our computer very fast. That's why it is called "Everything." The most impressive thing is the speed of the search, which lasts tenths of a second. For a larger amount of data, as 120,000 files, it will take up to one second to finish the search. This way, with ''Everything'' we do not have to do anything special. 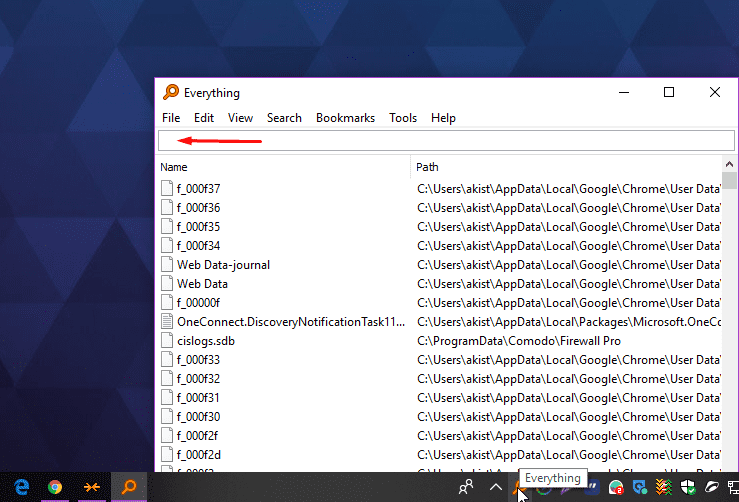 We simply click on the taskbar icon to open it and then type in anything we want to search for, as we can see in the picture below. 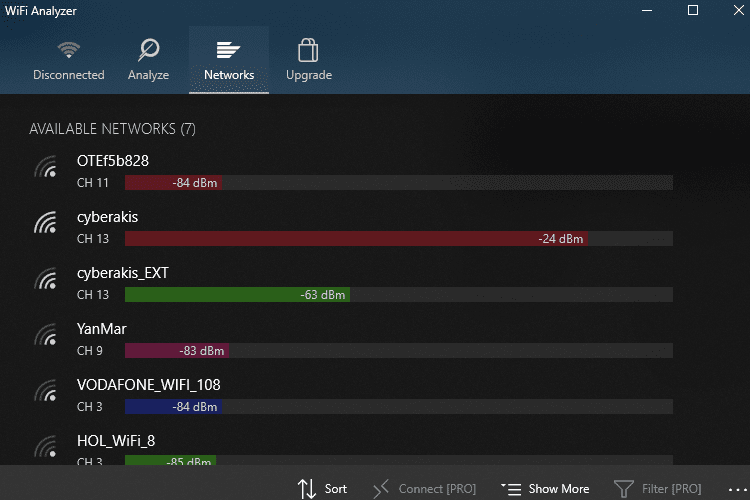 This is one of the new lightweight programs on Windows, which lets us know at any time which known or unknown devices and applications connect to our network and slow it down. Also, it indicates unusual changes in the programs we run. In reality, GlassWire is an extra assisting Firewall which doesn't use our system resources at all. 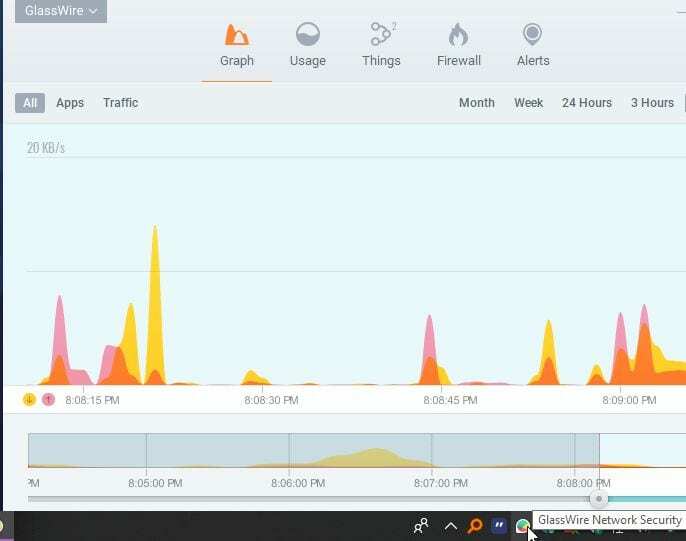 It shows a graph with the overall network activity that takes place on our computer. From that point on, if we are not satisfied with a particular application using the internet and don't need it, we can right-click on it and temporarily delete it. 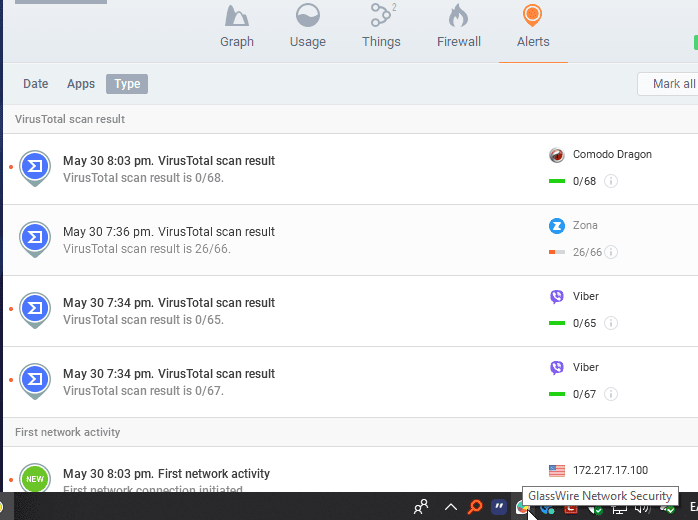 One of the best functions of GlassWire is the automatic scan of the applications that run with an internet connection. 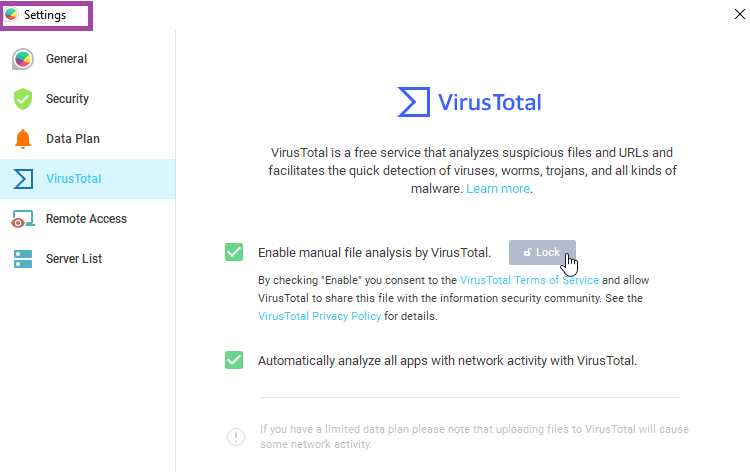 The scan takes place in real time, it is shown on a popup window, and it connects directly to VirusTotal and its latest application updates. 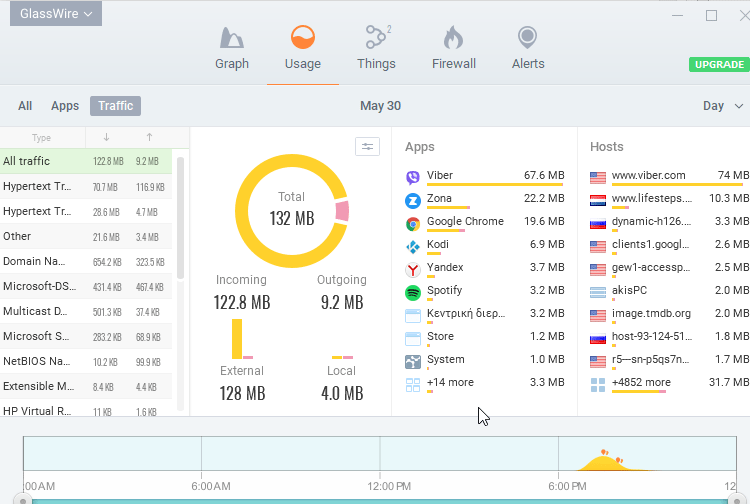 GlassWire free edition is more than adequate. 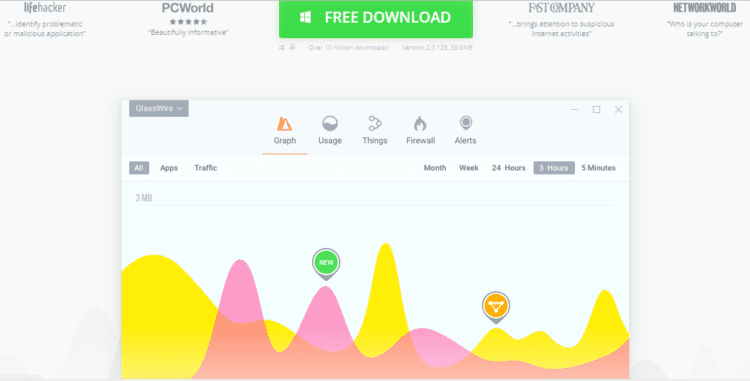 GlassWire Pro has even more powerful firewall characteristics, which are probably redundant for most of us since almost everyone would already be using another antivirus on the PC. 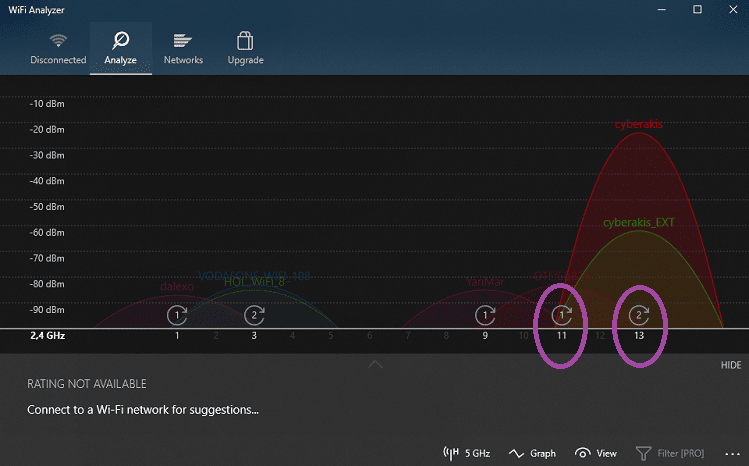 Wi-Fi analyzer, which many of us may be using on Android, can help us track which channel will offer us faster wireless internet. The only condition is to have a WLAN laptop or desktop. 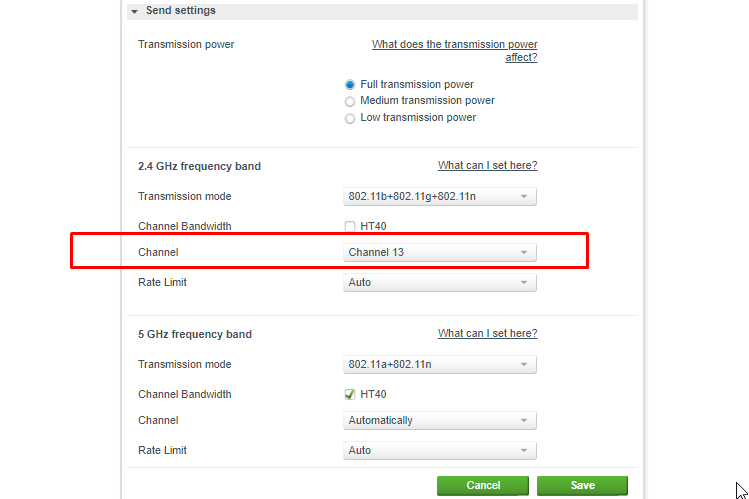 Once we change the channel from within the router environment, we will have increased the speed of the Wi-Fi, and this makes this light program very useful for our laptop and all our portable devices. Furthermore, we can find the ideal place for the wireless router, so that we get an even better range. The free edition offers more than enough, and it does not contain advertisements. We can download it from the Microsoft store. Usually, our computer connects to our wireless network automatically, and we don't have to fill in the password. But what happens if we have to connect with a new device or we have a visitor, and we can't remember the password to pass it on? And what if we never changed the super-complex initial password with the long line of characters? Nightmare. This light tool is fast and easy to use, and we will have the passwords within seconds so that we can copy them with a right click. It is free, we can use it on all the operating systems from Windows XP on, and it is available for 32-bit and 64-bit. We can download it here. If we work on two or more computers, there is no excuse not to be using already the miracle-worker Microsoft tool, which is undoubtedly one of the most lightweight programs that the company has ever created. It is not built-in on our operating system. 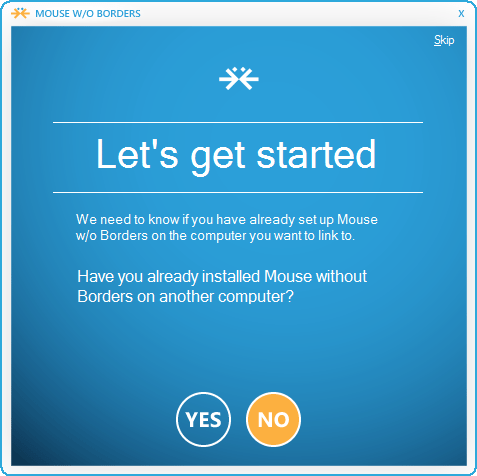 Mouse without Borders is the ideal solution if we want to connect up to four computers with the same mouse and keyboard, for free. It works without problems, and it does the job well. 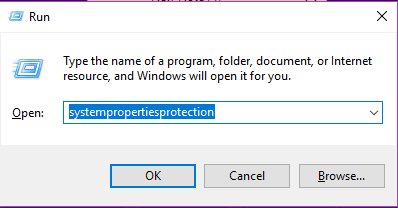 Even though most browsing programs can open PDF files, it is still worth installing a relevant program. 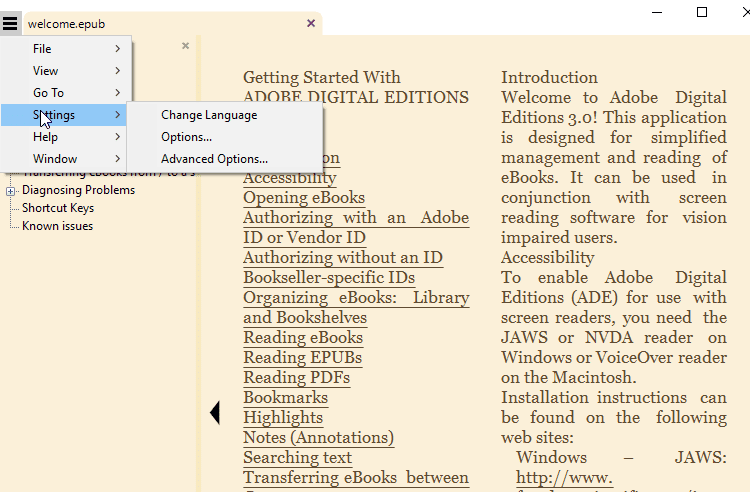 Especially if we want to organize our files in a better way, and our eBooks (ePub, Mobil). Sumatra PDF is exceptionally light. 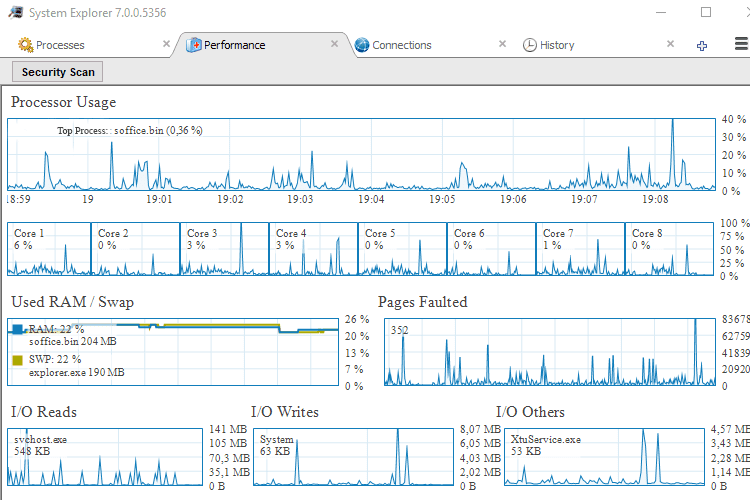 We need only say that in our measurements it consumed 0% CPU and approximately 56 MB memory. This was only the 1/4 of the resources that Adobe Reader used. Also, this lightweight program is portable. We can download it here. We can find this light free program on the Microsoft store, and it converts most file formats into PDF. Converter Bot is very easy to use. 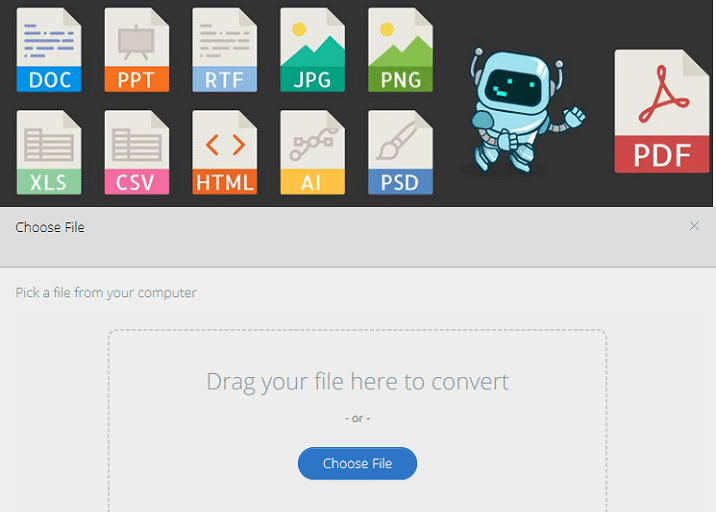 We can simply drag on it the file we want to convert, no muss no fuss, and we don't even have to be online. We can download it here. 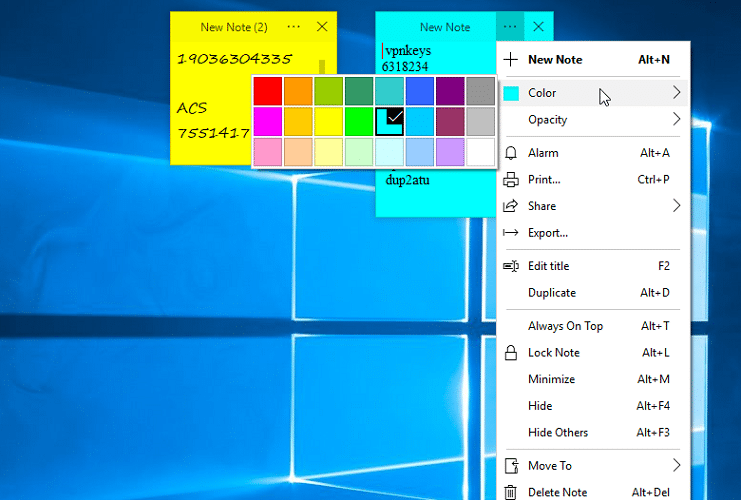 Windows have built-in sticky notes, but ''Simple Sticky Notes'' does it better, with more convenient functions, plus a useful pin on the desktop. We can download it here. Like Android, we also have the opportunity on Windows to select impressive, high-quality wallpapers in a simple, automatic way. Ideal for our desktop, but also for our screen lock and our profile picture. 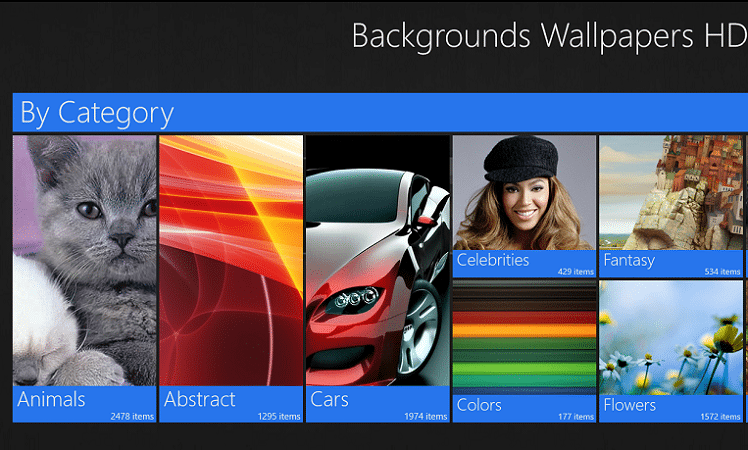 We can find "Wallpaper HD" for free on Microsoft store, and we can download it here. This is one of the most lightweight programs for picture editing. Perhaps you have never come across such a handy and straightforward photo editor so far. 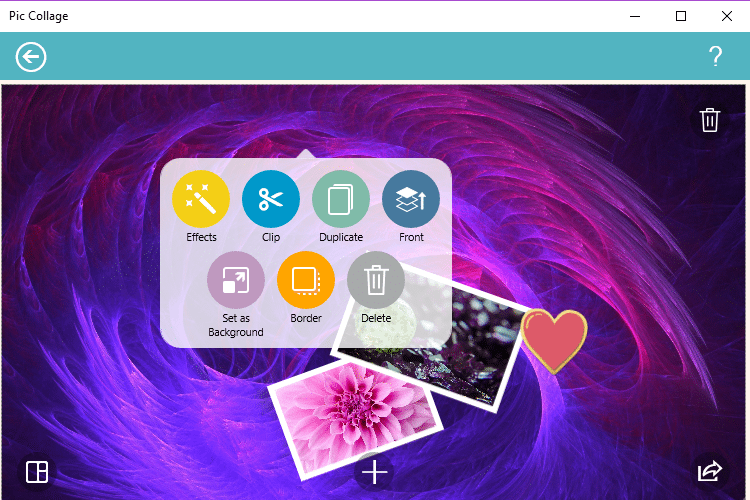 "Pic Collage" had first excited iOs users, and it will excite us all if we download it from Windows store. One of the biggest boons of this handy light program is the impressive Polaroid collages -and not just them- which we can create with our photos in an almost automatic way. The free edition of Pic Collage does the job well. Still, if we want to unlock two more features, we can do it with 2.50 dollars. 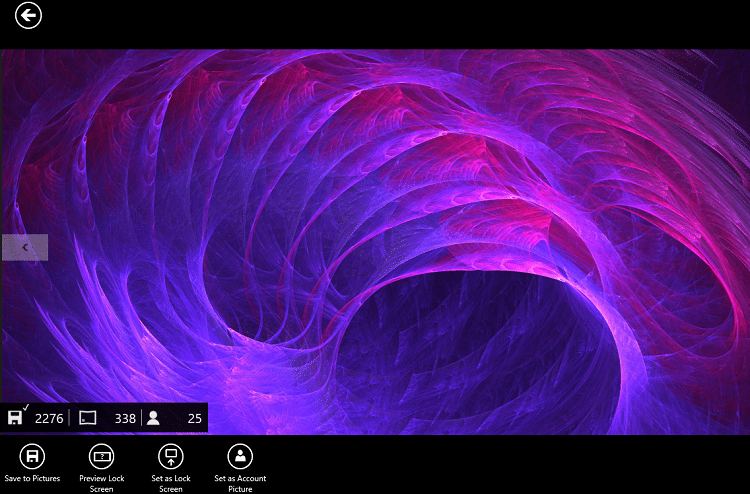 The application allows us to select any area on our desktop and take a screenshot of it as simply as possible. 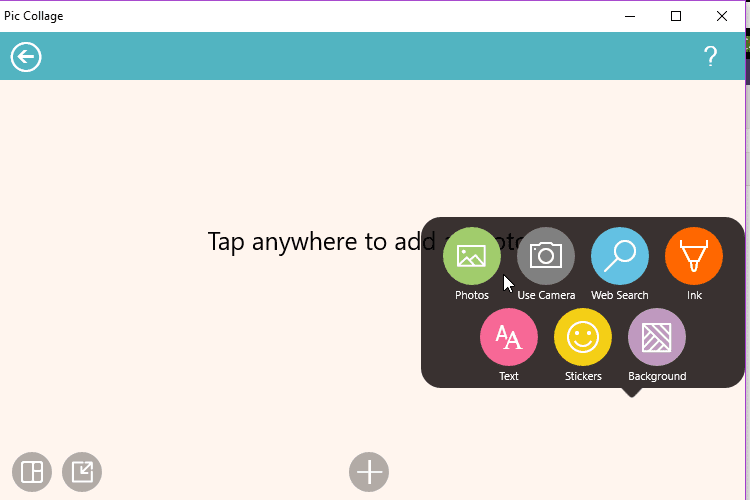 We can add text and select a certain screenshot size. Then we can set these features as default with the press of a single keyboard button. 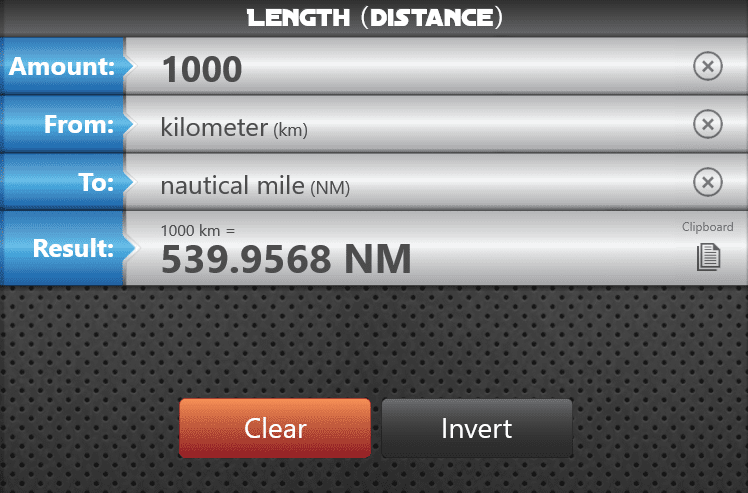 This is a very fast application that converts all measurement units. We type the value we want to convert, and the types of units show up automatically. We can download it from the Windows store. Often, when we work on texts on the computer, we have to copy and paste sentences and paragraphs regularly. However, we may get distracted owing to other actions that pop up and that we have to deal with while working on our task. 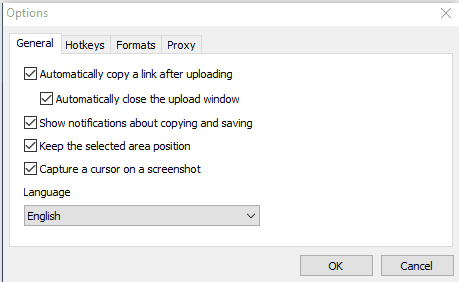 Ditto improves Windows copying and pasting because whatever we copy is saved on the clipboard. This way, we have access to it at any time. This application is a Windows clipboard extension. It saves whatever we have copied on the clipboard, whether it is a text, pictures, or HTML. The program will constantly run on the taskbar. From there we will be able to track anything we have copied. Furthermore, we can set how many days we want it to be on the clipboard. We are also able to save it at the particular location we desire. Ditto is on Windows Store, as well as on Sourceforge. Apart from being an open-source program, FDM is also one of the lightest and handiest programs, which should not be missing from any Windows PC. 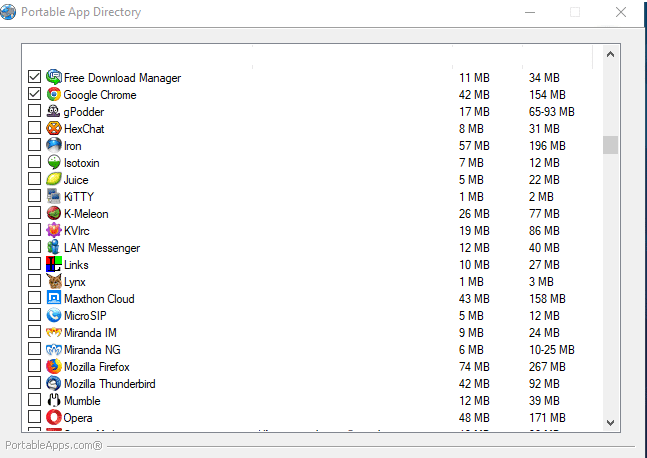 Also, it is considered the top downloader accelerator and downloading manager. As an open source software, all its features are free. The program is approximately 48MB and runs on Windows XP and all later versions. It doesn't take a long time to download FDM on Microsoft software, and it is risk-free from other unwanted third-party applications. There is also a Lite edition, which is ideal for computers with low performance. One of its strong assets, apart from fast downloading, is that we can download any video on the web with a right-click. Εven if we were not allowed to download it from the particular website in the first place. We can do the same thing with YouTube videos. We simply click on the page and then on the area under the video. 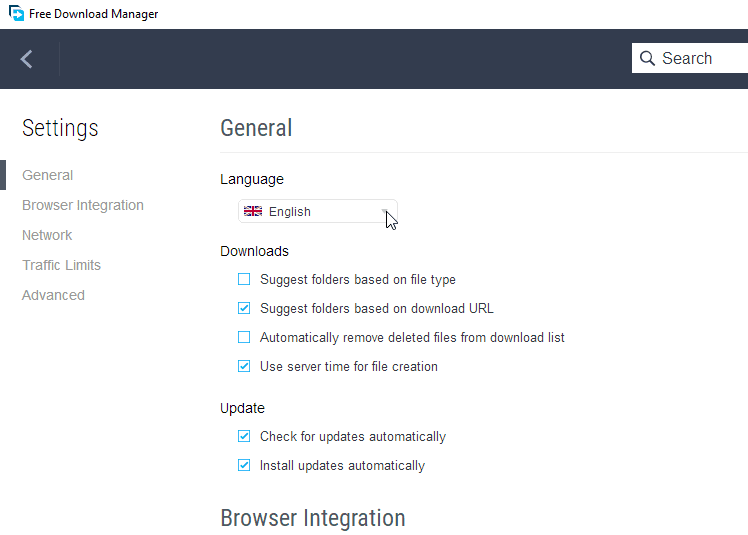 Furthermore, FDM supports pausing and continuing our downloading at any time. 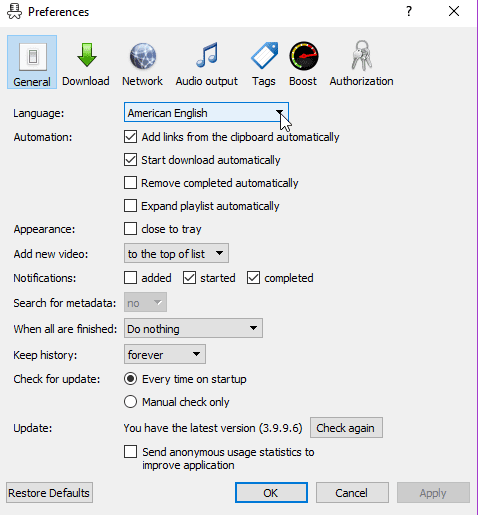 It also supports the BitTorrent protocol, by offering fast and categorized torrenting. The PC switches off automatically with the completion of the downloading. 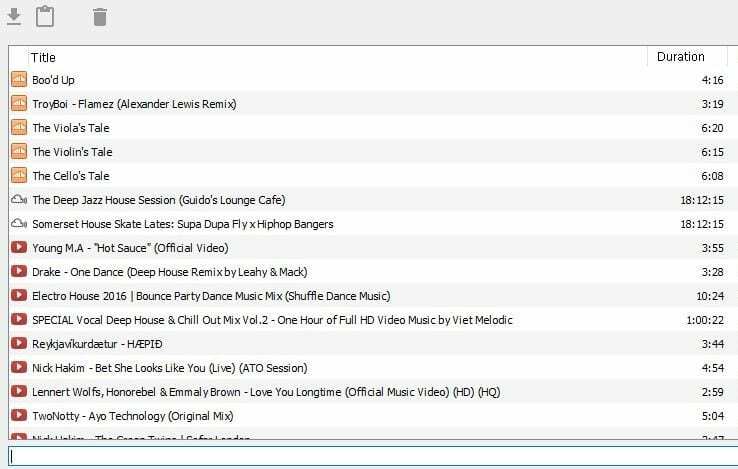 MediaHuman is a free and light program with excellent potential at simultaneous track downloading from YouTube, and any other website with videos and music with downloading restrictions, such as Vevo, Soundcloud, Mixcloud, Facebook, etc. This application offers fast downloading and automatic actions which are features we can only find on paid programs. Another advantage is that it performs updates almost every week. It looks as though YouTube is not going to get rid of it any time soon. It is definitely worth exploring the whole program. There are so many useful functions and several settings for the quality of the tracks to find out. 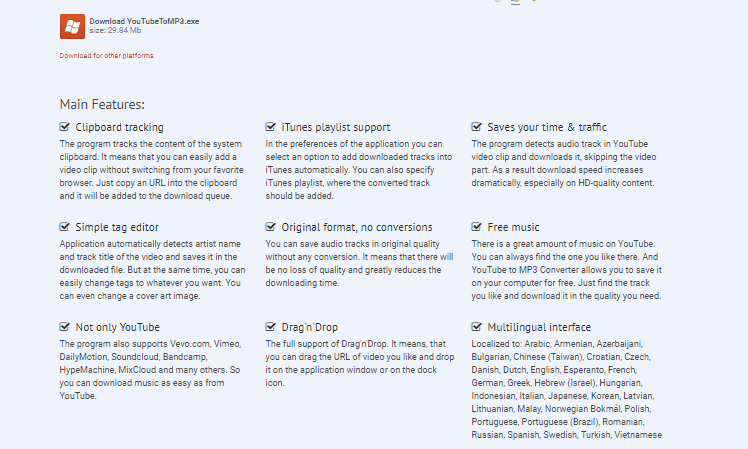 One of the best features is that it converts and downloads at once all the tracks of a playlist, without exception. And it does this in the fastest possible way. Furthermore, it is ideal if we want to save Spotify playlists or other similar subscription services on our hard drive, on a USB flash drive, or on an SD card. All we have to do is copy the address of the video, music, or playlist. Then, MediaHuman will start downloading automatically without us having to do anything else. The light and useful MediaHuman takes up only 28 MB, and we can download it here. There are lightweight programs for tasks we are already doing, but there are also lightweight programs for things we might not have thought about. 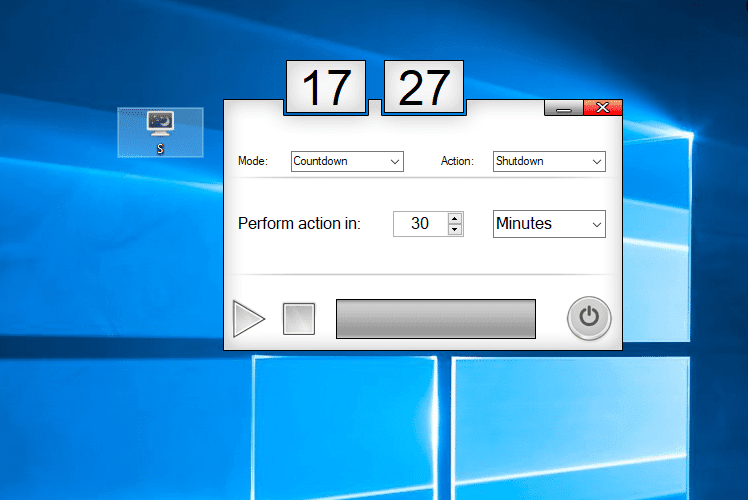 Sleep Timer is a simple adjustable timer which does not even require a setup. It can be handy when we are downloading, but we have to go somewhere. Or it is simply bedtime, and we have to switch off the PC. All we have to do is set the time of the switch-off or sleep of our PC by clicking on its lovely little icon. We can download it here. When f.lux first appeared several years ago on iOS jailbreaking, it became a sensation amongst Apple software users. 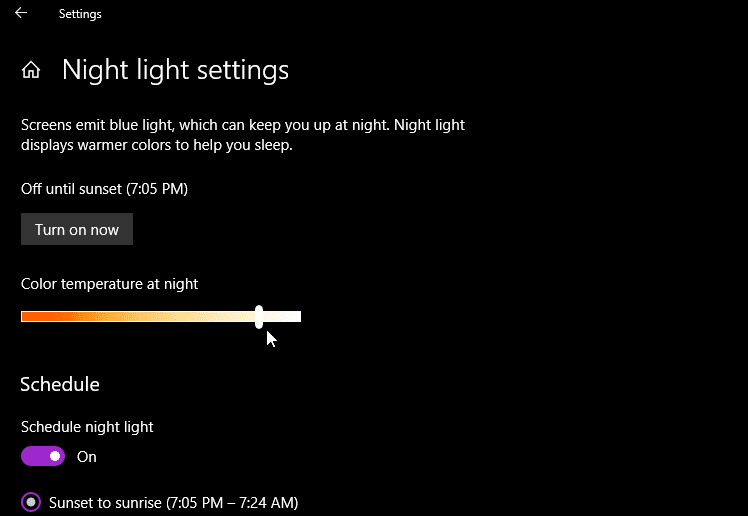 This light program is on Microsoft store, and it does much more than adjusting Windows night-time brightness. During the day, the computer screens won't bother our eyes. Even though they emit cold white or intense bluish light, they still adjust with the natural sunlight outside. However, during the evening and night, the radiation will definitely make our eyes tired. Plus, there is evidence that it harms our health too. This program offers the unique feature of adjusting the color temperature of our screen. 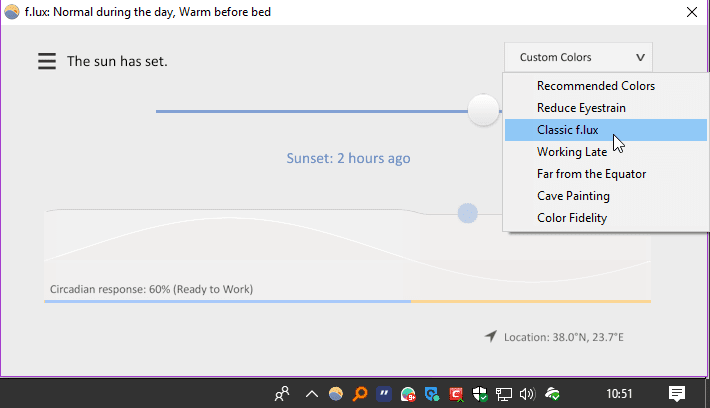 According to the time of the day, f.lux adjusts it either automatically or manually, by changing the color warmth when it gets dark and by restoring it when it is morning again. 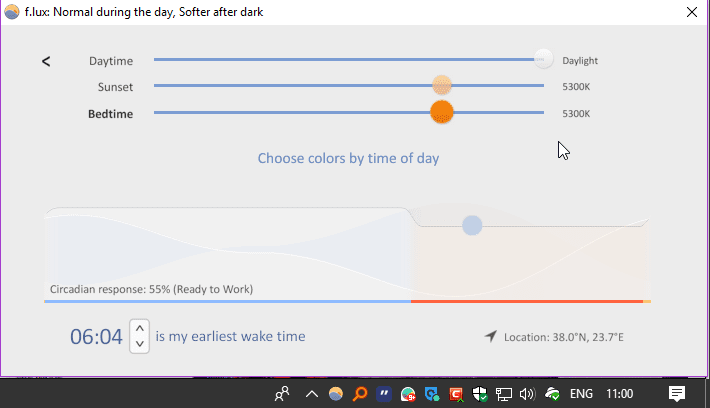 These color changes have been designed to assist our well-known circadian system, and they become even better when we are about to watch a film or surf the internet for a long time. In this case, two relevant features boost the color effects for 2.5 hours and allow us to watch movies or surf much more comfortably. These features are "Movie mode" and "Soft White," and we can find them by clicking on "Effects and extra colors." The only "disadvantage" is that it could potentially take us some time to get used to the multiple functions and set up the automatic screen brightness feature according to our tastes. But of course, we could always do it manually. Alternatively, we can try the built-in function for night light mode, which we could customize a little. We can find it on this route "Settings→System→Screen." Many of us have a laptop with little storage; others simply want to carry around all our favorite light applications on a USB flash drive. Especially, if there is a need to run them on any computer we want. We might want them on our main computer so that we can set them up without slowing down the PC. This way, we are also able to delete the app folder if we don't need it anymore. 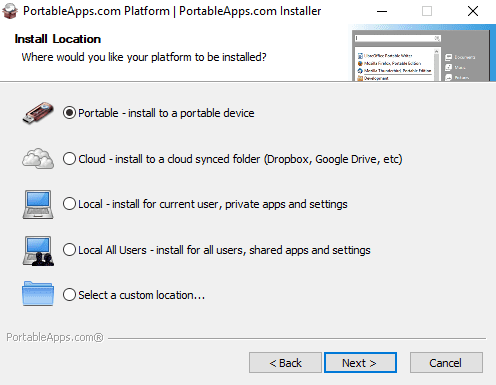 "Portable Apps" can do this job properly because it is a portable Appstore. If we set everything at the beginning, we won't have to install from a USB stick or another Cloud service. So, if we are up for it, we can select dozens of lightweight programs like Ditto and FDM that we have already mentioned. As well as many other portable applications, such as VLC, Chrome, Firefox, 7- Zip, CCleaner, LibreOffice. 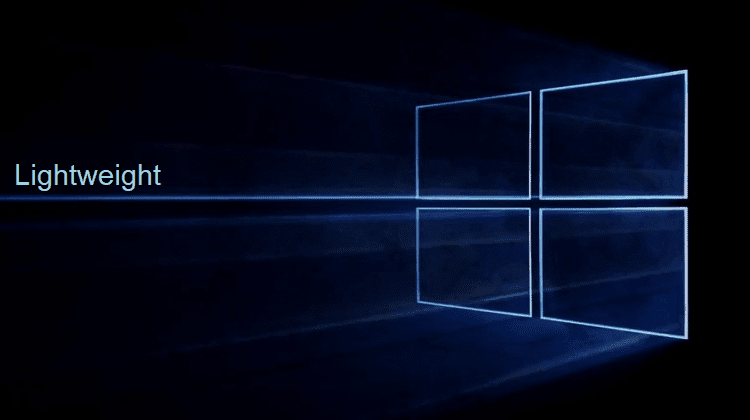 With lightweight programs that use little storage and almost no system resources, we can improve our Windows experience even more. If you have any questions or you want to make your own lightweight programs suggestions for Microsoft software, you can write to us in the comments below.